“Attendance Works is an amazing organization that has provided tremendous leadership in promoting an important strategy for achieving educational equity." Across the country, more than 8 million students are missing so many days of school that they are academically at risk. Chronic absence — missing 10 percent or more of school days due to absence for any reason—excused, unexcused absences and suspensions, can translate into third-graders unable to master reading, sixth-graders failing subjects and ninth-graders dropping out of high school. Read this research summary for more details. Children living in poverty are two to three times more likely to be chronically absent—and face the most harm because their community lacks the resources to make up for the lost learning in school. Students from communities of color as well as those with disabilities are disproportionately affected. This isn’t simply a matter of truancy or skipping school. In fact, many of these absences, especially among our youngest students, are excused. Often absences are tied to health problems, such as asthma, diabetes, and oral and mental health issues. Other barriers including lack of a nearby school bus, a safe route to school or food insecurity make it difficult to go to school every day. In many cases, chronic absence goes unnoticed because schools are counting how many students show up every day rather than examining how many and which students miss so much school that they are falling behind. 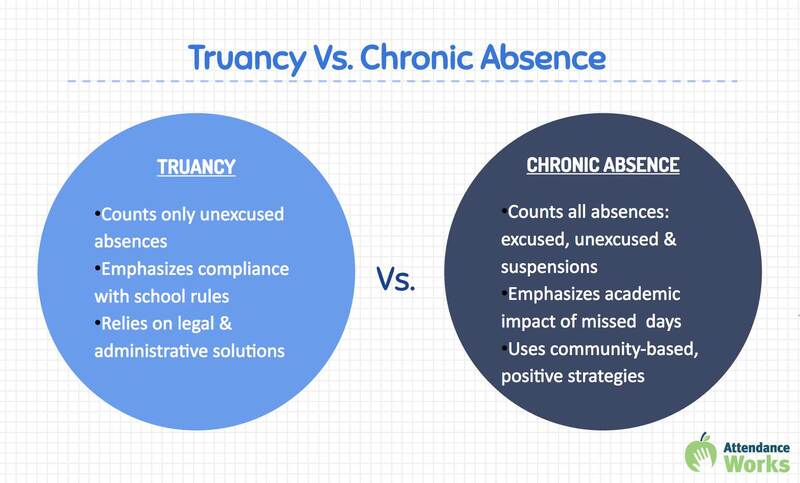 Read our blog about truancy and chronic absence. While chronic absence presents academic challenges for students not in class, when it reaches high levels in a classroom or school, all students may suffer because the resulting classroom churn hampers teachers’ ability to engage all students and meet their learning needs. The good news is that our work throughout the country shows us that chronic absence is a solvable problem. What works is taking a data-driven, comprehensive approach that begins with engaging students and families as well as preventing absences from adding up before they fall behind academically. The key is using chronic absence data as a diagnostic tool to identify where prevention and early intervention are needed. With this data in hand, schools, families and community partners can together determine the causes of chronic absence, and implement approaches that address barriers to getting to class. The federal Every Student Succeeds Act requires districts and states to collect chronic absence data and report it publicly. The majority of states have adopted chronic absence as a measure for school accountability. The challenge of improving attendance is to avoid making the incorrect assumption that chronically absent students or their parents simply do not care. By working together, all of us — schools, public officials, public agencies, civic organizations, businesses, philanthropic groups, families and students — can ensure all children can get to school every day so they have an opportunity to learn, flourish and realize their dreams. Find out more about Chronic Absence by choosing a section in the menu at right.